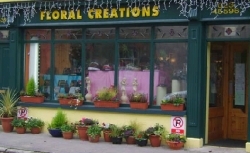 Located in Cork Floral Creations florist has been in business since 1995. As a member of the Interflora flower relay network this outstanding florist serves the flower needs of County Cork and beyond. Regardless of the occasion you can rely upon Floral Creations flower shop to deliver your beautiful bouquet to that someone special in your life. For the very best value in flowers in Cork call Mary now to order that unique and original floral arrangement or flower bouquet from this outstanding florist.